I assume (but correct me if I am wrong) that this page is intended for messages from the Canadian government. "Limitations" seems clear enough—I imagine that if the Canadian authorities don't want me to travel to, say, the Republic of Molvanîa, then they will write this limitation on this page. Then again, I suppose whether to admit me to Molvanîa is the sole prerogative of the Molvanîan government. (I have never seen an airline scrutinize anyone's "endorsements and limitations" passport page before letting them on an international flight; all they seem to care about is the ID page and the visa. So even if I have a no-Molvanîa limitation in my passport, what's to stop me from getting on a plane bound to Molvanîa?) What sort of limitations can be written here that are actually effective, and who enforces them? And what is an "endorsement"? The usual meaning of this term in English is something akin to "support" or "approval". For what travel-related purpose would I need an explicit statement of approval from the Canadian government in my passport? The passport already states that it's "valid for all countries", so I can't fathom what extra benefits an endorsement might provide. Or is "endorsement" a legal term that means something different in this context? If so, what is this meaning, and how does it differ from "limitation"? Of course, in this age of digital records, this all seems a little quaint and these pages will probably go the way of the dodo someday. Not the answer you're looking for? 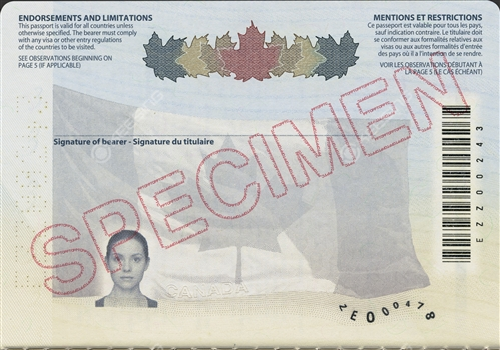 Browse other questions tagged passports canadian-citizens or ask your own question. What are the possible characters for a German passport number? From Sweden to Bulgaria and vice versa, do they stamp the passport?